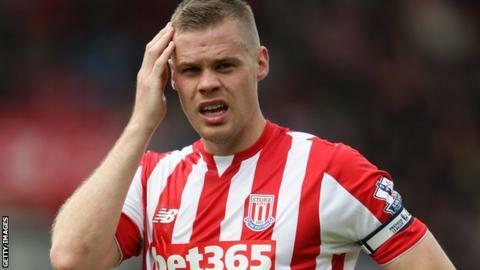 Stoke City captain Ryan Shawcross has said it would be a major disappointment if the club finished outside the top 10 in the Premier League this season. The Potters' 2-1 loss to Crystal Palace was their first at home since October and kept them 11th in the table, behind Everton on goal difference. "We've got the best squad Stoke's ever had," 28-year-old Shawcross told BBC Radio Stoke. "If we don't finish top 10, it'll be a very disappointing season." After getting off to their worse start to a Premier League campaign, a run of five wins from seven games lifted Stoke to within two points of the European places. The League Cup semi-finalists, who have finished ninth in the last two campaigns, then produced an impressive display in beating Manchester City 2-0 before one point from their last two games has Mark Hughes's men hovering just outside the top 10, six points adrift of Palace in sixth. "We've had a lot of games where we've should've won by a lot more than we have," said Shawcross. "The chances are there for us and we've got to convert them and climb up there." And, with Manchester United visiting the Britannia Stadium on Boxing Day, Shawcross is confident they can rediscover their best form. "I think when the big teams come here everyone knows we usually do very well against them," he said. "We've shown we can beat the best of them and hopefully there'll be a red-hot atmosphere."